Slitter Rewinder Superior(FSL-T) - HCI Converting Equipment Co., Ltd.
FSL-T Slitter Rewinder is designed for slitting all types of flexible packaging films, photonics and optical materials. Such as cellophane, PET, OPP, CPP, PE, PVC, paper rolls, counterfeit-proof labels. 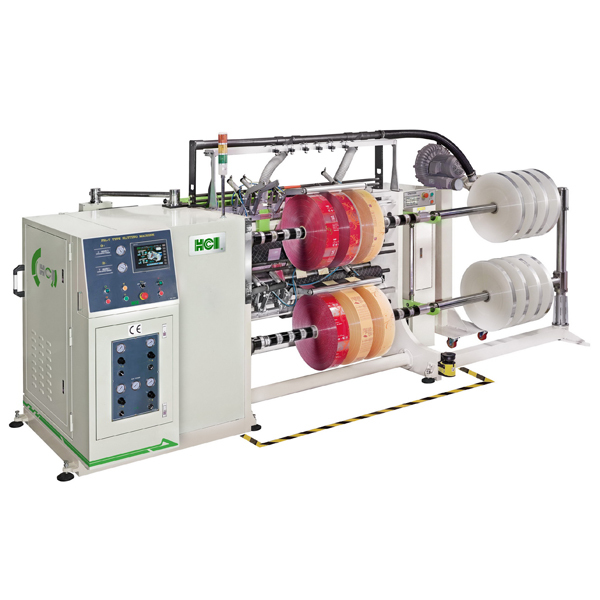 The HCI FSL-T is a universal Slitter Rewinder on the market. The left and right unwind arms are driven by motor; the operator can adjust the width freely. Equipped with pressure chuck for clamp the parent roll quick and easy. Single operator is required to manipulate and load the parent roll. Whole unwind stand can move horizontally, left and right each 50 mm. It can ensure the accuracy of slitting position. The unwind tension is sensed by load cell and compared to setting value. The PLC will increase or decrease it according to the calculating difference automatically. 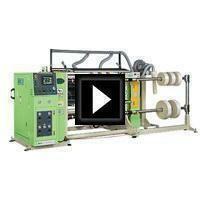 It can maintain the stable tension output during whole slitter operation. Tension isolation point through pneumatic nip rubber roller, giving perfect isolation between the unwind and rewind. It also ensures no slippage or scratches when Slitter running. Razor in groove roller & Shear knifes. Equipped with shaft tracks, ease for installation. Equipped with protecting cover, prevent personal injured. All FSL-T Slitter are equipped with vacuum type trim disposal. Specially designed ejectors with powerful ventilators remove the slit edge of web. Anti statics brushes discharge electrostatic charge when plastic material is being slit and rewound. There are two sets of anti statics brushes, one prior to upper rewind shaft, the other prior to lower rewind shaft. Automatic calculation control for rewinding tension, employs HCI's self-developed precision friction rewinding ring, combined with automatic side-pressure compensation. Two independent rewinding motors and an intelligent rewinding diameter control system assure extremely stable rewinding tension without the need to adjust it when speed and diameter varied. Equipped with 4 sets of independent lay-on roller. It can adjust the position and width according to the actual slit rolls. It guarantees full contact between lay-on roller and slit roll. To built the good slit roll structure. Upgrade to Servo motors driven is available for FSL-T Slitter. Unwind auto stop and break stop function.